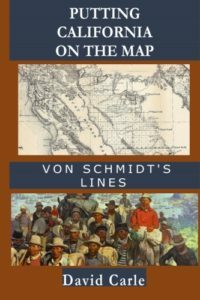 Local author David Carle’s new book is PUTTING CALIFORNIA ON THE MAP: VON SCHMIDT’S LINES, the biography of Allexey W. von Schmidt, who was a ’49er, surveyor and civil engineer. Von Schmidt was the first government surveyor to work in the Eastern Sierra. Before there were any mines or homesteads, in 1855 he extended the Mt. Diablo Meridian across the Sierra Nevada, across wildlands that would eventually become part of Yosemite National Park. In 1856 and 1857 he completed township and section surveys from north of Mono Lake to below Owens Lake. He returned in 1872 and 1873 on the first complete survey of the California/Nevada boundary line. Not just a surveyor, von Schmidt was a civil engineer who devised long-distance water delivery systems for San Francisco and astonishingly creative engineering solutions in San Francisco Bay. His energetic accomplishment, though, a little remembered today, perhaps because he died just a month after the 1906 earthquake and fires that devastated San Francisco. This biography is the first comprehensive telling of his life and of his leadership in the shaping of 19th century California. He was a Californian from 1849 through 1906, helping the young state develop a reputation as a society of innovators and energetic problem-solvers, and an involved citizen of San Francisco, a father and husband, and a pioneer whose personal triumphs and tragedies enlarged the California Dream. On Thursday, May 31, from 3 to 5 PM, the Eastern Sierra Interpretive Association will host Carle at the Mono Basin Scenic Area Visitor Center in Lee Vining for a slide talk and “meet the author” event. 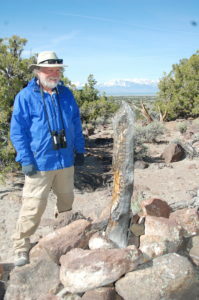 Since retiring from a career as a state park ranger at Mono Lake, Carle has authored 13 non-fiction books and two novels and is currently the President of the Mono Basin Historical Society. This new book should be on bookstore shelves soon.